There exists a belief among many people that when it comes to feeding one’s family if it’s cheap it cannot possibly be healthy. That’s a myth. Don’t believe it. Eating healthy while sticking to a budget comes down to shopping smart and cooking at home, mostly from scratch. It’s all about time and money—the two things that for most families are in short supply these days. Most of us just don’t have the time to do a lot of menu planning, recipe scouring, and strategic grocery shopping to make sure we have what we need, when we need it to make fabulously healthy food! And if you are a regular here, you know my solution is eMeals. Honestly, eMeals saves my bacon week after week. I hope you enjoy this recipe from the eMeals Healthy menu plan. For less than the price of one muffin from Panera Bread, I can make this entire recipe and come out with a dozen healthy muffins, and in less time than it would take to get in the car, drive to the mall, find a parking space, stand in line, get the muffin and make my way back home. And I know exactly what’s in these muffins. In a large mixing bowl, whisk together whole wheat flour, all-purpose flour, baking powder, baking soda, cinnamon, allspice, nutmeg, and salt. In a medium mixing bowl, whisk together brown sugar, egg substitute, and oil until smooth. Add applesauce and diced apple, and stir to combine. Add applesauce mixture to flour mixture, and stir just until combined, being careful not to over mix. Fold in chopped nuts if using. Spoon batter into 12 muffin cups sprayed with nonstick cooking spray. 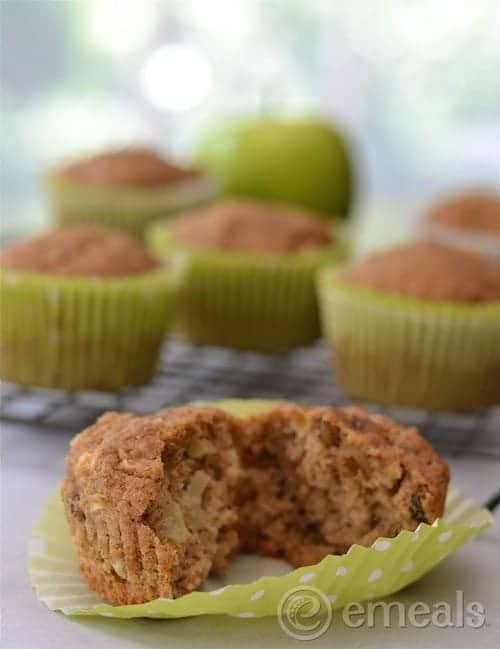 Bake for 15 – 18 minutes, or until a toothpick inserted into the middle of a muffin comes out clean. Don’t over bake! Cool in the pan for 5 minutes. Remove muffins from pan and cool completely on a wire cooling rack. For less than the price of one muffin from Panera Bread, I can make this entire recipe and come out with a dozen healthy muffins, and in less time than it would take to get in the car, drive to the mall, find a parking space, stand in line, get the muffin and make my way back home.